A home in the U.K. was invaded by a monstrous colony of wasps, and the infestation was like a scene out of a 1960s Hitchcock movie, a local pest controller said. "I couldn't believe my eyes," John Birkett, an employee at Longwood Services Pest Control, told ABC News today, referring to the nest of an estimated 5,000 wasps. "It was like the horror film 'Birds' but [with] wasps." Birkett said he got a call from the homeowner’s son on Sunday about a nest that had taken over a bed in a spare bedroom in the home in Worchester, Hampshire. The colony was devouring the bedding. In more than 40 years of working in the pest control business, Birkett said this was the largest nest he had ever seen. "I got dressed up looking like 'Batman and Robin' and went into the little tiny bedroom. I was spraying them left right and center," Birkett said. 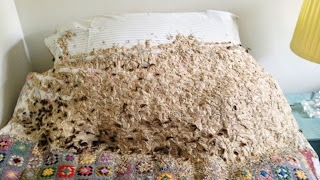 After two hours of swatting and spraying, Birkett said he was able to get rid of the wasps and even salvage the crocheted blanket they were nesting on. The nest had grown so large because the family rarely uses the room on the second floor of their five-bedroom home, he said. The wasps snuck in through an open window and used the bed as their home for nearly three months, chewing through eight inches of the mattress and two pillows, according to Birkett. The family most likely didn’t hear the wasps accumulating because they are silent while nesting, he said. "That would be quite nice to keep," Birkett said of the massive hive. "They've worked really hard at this. But the [homeowner] didn’t think that was a great idea." daripada gambar tu,, takut jugak ek.... tpi ni sarang apa ek? tebuan?